On this page, you will find out the optimal stat priority for your Frost Mage. We first present the stat priority, before delving into more complex explanations. Our content is updated for World of Warcraft — Battle for Azeroth (BfA) 8.1.5. Stat weights are very personal, especially for Frost Mages. They will fluctuate with every piece of gear you change, and no one can give a good global set of weights that is actually accurate. It is highly recommended you simulate yourself, as shown on the Simulations page to figure out your own weights. Critical Strike proc effects will skew this. They will cause an effective drop-off as you near 33.34% due to the nature of being Shatter capped for part of the fight, but not all. This issue is why simming gear changes, rather than relying on stat weights, is the best option in all cases. There is an interesting artifact at play with stat weights because of how SimulationCraft calculates them. This does not impact the simulation, but it does impact things that use your stat weights to estimate gear upgrades, such as Pawn. As you near the Shatter cap, the stat weight will seemingly gradually fall off. This is actually not true. What is happening is that the simulation is checking what happens if you add 238 of a stat, and how much gain per point that would be. As you get closer and closer to cap, the sim will see that as a lower and lower average gain because more of the simulations are run beyond the cap. 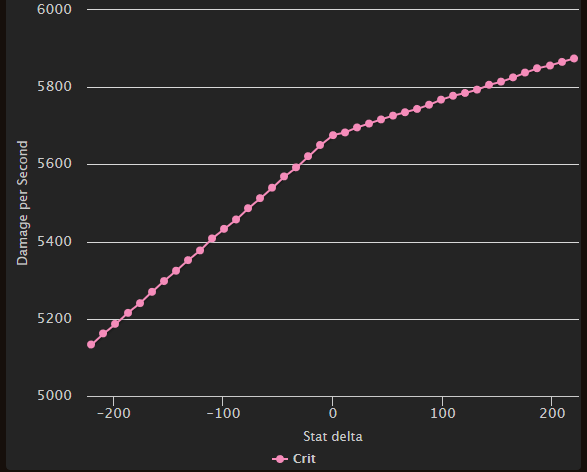 In reality, the change is sudden, and can be viewed by running a stat graph while near Shatter cap. No stat should really ever be hard stacked. Everything works off each other. Haste is great, but there comes a point where slower yet effectively higher damage per cast time spells would be better, through stacking Mastery to improve Frostbolt's damage. Yet if you were to do the opposite, stacking Mastery to the exclusion of Haste, you would see the opposite show up. Faster, slightly weaker, casts would be better than heavily stacked Mastery casting very slowly. This is the primary reason stat weights are not static, and in fact, change with every piece of gear. Stacking even a small portion of stats has skewed the weights so hard that Haste is now valued above Critical Strike, and very nearly above Intellect. This very basic stat priority has been obtained by combining common sense, years of experience, and simulations using SimulationCraft. It has not been tested at all gear levels, has not been tested at all possible target numbers, and has not been tested with all talent configurations. Please, sim your own character for improved accuracy. Intellect is your "primary" stat, meaning that you use it rather than Agility or Strength, not that it is the best in all situations. It provides you with Spell Power, which increases the damage of your spells. Versatility is a flat-out damage done increase and damage taken reduction. Critical Strike increases your chance to Critically Strike. Remember that your chance to Critically Strike with many spells is increased by Shatter, a Frost-specific passive ability. Mastery: Icicles causes Frostbolt and Flurry casts to store an Icicle, which deals an amount of damage determined by both your Mastery stat and Spell Power. Icicles are unleashed passively by Ice Lance casts, or actively using Glacial Spike (if talented). Mastery also increases the damage of your Frozen Orb. Haste decreases the cast time of your spells. In particular, decreasing the cast time of Frostbolt is very beneficial because it means that you can cast Frostbolt more often, increasing your chances to get procs and the rate at which you generate Mastery: Icicles. Haste also lowers your base Global Cooldown as well as the cooldown of Blizzard. Haste also increases the cast speed of your Water Elemental and Mirror Images. One Icicle is produced for each Frostbolt or Flurry cast. You can have a maximum of 5 Icicles. Generating a 6th Icicle will automatically fire the oldest one. Ice Lance will rapidly fire all currently held Icicles, and any Icicles generated before that barrage ends, at the target. They disappear after 60 seconds, if you do spend them or do not gain new ones. They can Critically Strike, and interact with Shatter. Mastery: Icicles functions a little differently when you are playing with the Glacial Spike talent. Glacial Spike requires 5 Icicles to cast, and consumes all 5 Icicles. Ice Lance will no longer fire Icicles in a barrage. Because of Shatter, it is possible to have more than a 100% chance to Critically Strike with any given spell. To obtain your Critical Strike chance against frozen targets, Shatter multiplies your Critical Strike chance by 1.5 and adds 50%. At 33.34% Critical Strike chance, for example, your chance to critically hit frozen targets is 100.01% (33.34% x 1.5 + 50%). 15 Oct. 2018: Attempt to clarify Shatter cap weight oddity, and clean up misconception of ignoring sims. 06 Aug. 2018: Corrected Glacial Spike mechanic misunderstanding, added stat stacking examples, corrected false information regarding Crit weights. 19 Jul. 2018: Updated for recent hotfix buffs.